Why Umbrella Insurance: What You Need to Know About It and Should You Get It? Umbrella insurance is a policy that offers you more liability coverage. The coverage you receive with umbrella insurance exceeds the liability limits imposed on your initial insurance coverage, which includes boat insurance, home insurance, and auto insurance in Connecticut. To qualify for umbrella coverage, you need to have a primary coverage in place. For instance, if you own a home or car in Connecticut, but you do not have homeowners insurance or auto insurance, you cannot apply for umbrella insurance until you get primary coverage for your home and car. When you apply for extra liability coverage, you also receive an umbrella insurance coverage. Your umbrella insurance coverage helps you pay off the expenses caused by a lawsuit where the court finds you at fault. Since your primary coverage has liability limits, you will not have sufficient money to cover your losses. If you have umbrella insurance, you will have sufficient money to cover your losses. Should You Apply for Umbrella Insurance? Umbrella insurance can protect you from lawsuits in the event of an auto accident for instance. The real question you need to answer is how much home and auto insurance should you have in the state of Connecticut? Next question you need to ask your self is if umbrella insurance would be sufficient coverage to protect you from future losses. You should discuss this with your insurance agent to understand your liability limits and the options pertaining to those limits. When you sit down with your insurance agent, be sure to discuss what having less or more liability insurance on your coverage means for you. It is essential that you have sufficient insurance coverage to protect you, your family, and your assets. Most people do not understand the importance of having umbrella insurance, often asking themselves why, the average person would need to apply for umbrella insurance in Connecticut. Well here’s the answer: You need the extra coverage that comes under umbrella insurance because unfortunate and unexpected incidents happen and when they do, they become a real financial burden. Umbrella insurance can decrease your financial burden. For example, you get into a car accident where you sustained injuries, the other driver sustained injuries, your car sustained damage, or/and the property sustained damage. You will have to pay for the people, cars, and property that sustained damage and on top of it all, you have to pay for your medical expenses. Your primary liability coverage can only cover you to a certain extent. When it reaches the limit, you will find yourself paying money out of your pocket. If you have umbrella insurance, once your initial coverage reaches its limits, your umbrella insurance will go into effect, paying for the remaining auto and property damage and medical expenses incurred due to the auto accident. Another scenario to consider is if the other party sues you, you might not have sufficient money to settle the lawsuit or worse, you may not have the money required to go to court and hire an attorney. In that case, the party suing you will target your assets in court. For this reason, it is highly recommended that you apply for umbrella insurance. Without it, the suing party will go after your cars or home. It does not matter how many possessions you have or what their value is. In the end, what matters is that you protect them by obtaining umbrella insurance in Connecticut. Even though the accident may have been small, it could turn out to be a nightmare if you do not have the finances to cover the losses or if the other party sues you for damages. If you want to protect your property, cars, and possessions such as your pension plans and 401k, you need to apply for additional liability coverage by obtaining umbrella insurance. You are teaching your son or daughter to drive. They get into a car accident, but the costs surpass the limit on their auto insurance coverage. Your yard has a hole and your neighbor trips, falls due to it, and sues you for $740,000, but your homeowners insurance only covers you up to $300,000. You host a small gathering at your house, a guest slips on wires and sustains an injury, and now, you have to pay for their medical expenses. In all these three scenarios, your primary insurance coverage will fail to cover you, only paying for the damages up to a certain extent, and from there, your umbrella insurance will take over. What Should You Consider When Opting for Umbrella Insurance? An additional layer of protection can assist you make situations, where you are found liable, more manageable, and less costly. Umbrella insurance will cover you against all “what if” situations involving your car or property where the accident occurred. Umbrella coverage offers you additional liability coverage in certain instances such as if you are involved in a serious auto accident where you are at fault as well as in the event you are in a foreign country where you have rented a car to drive. Umbrella insurance is not for the rich. Most people believe the opposite thought and forgo obtaining umbrella insurance. The reason why some people tend to think that umbrella insurance is only for the wealthy is that of the common misconception that it offers an average of $1 million to cover lawsuits. Now, that is a lot of money so why would an average person earning a modest income need that much coverage in the first place. Most people fail to realize that you do have to be rich or an average earner to encounter a liability lawsuit. If you encounter a liability lawsuit, you might have insufficient insurance and funds to pay for it. If you are the responsible party, meaning you were at fault for property damage, injuries, or death, you are at risk of having the affected party sue you for all you are worth. The affected party may sue you for far more money than your initial insurance coverage offers you. If you have umbrella insurance, you will not have sleepless nights, wondering how you pay for the liability lawsuit, as your umbrella insurance will take over once your initial policy reaches its coverage limit. To obtain umbrella insurance, you will need to pay around $300 each year. Even though you might find the amount expensive, it really is not if you compare it with how much it costs you to have coffee each day. This small yearly cost will give you up to $1 million in insurance coverage in case of liability lawsuits. If you ever require umbrella insurance in the future, you will thank your lucky stars that you took the decision to obtain it and pay for it yearly. Without umbrella coverage, you could find yourself in a bad situation. Never say never! You never know when bad luck might strike you. It is better to be safe than sorry, which is why you require umbrella coverage. You can never anticipate an auto accident, but when it happens, it shakes your entire world, especially if you get sued and have to pay for medical expenses and damages to the car and property. Since it covers your entire family, you will feel safer knowing that if your child gets into an auto accident of a severe nature, umbrella insurance will protect you from losing a lot of money, paying for the expenses that were incurred because of the auto accident. And What Doesn’t Umbrella Insurance Cover? Umbrella insurance will not cover you if you cause damage to your own property, experience business losses, or if you are convicted of a crime or held responsible for damages incurred to a property that was done intentionally by you. Even if you run a home-based business, umbrella insurance will not cover you nor will it cover any business related lawsuits such as malpractice lawsuit or losses that occurred where you worked for a governing board or a for-profit organization. Umbrella insurance will also not protect you from disputes that arise from a written or oral contract you have entered into with another person or a group of people. In short, you should obtain umbrella insurance in addition to your primary insurance coverage, as it will benefit you in the long run. The best way to calculate your umbrella coverage amount is starting by calculating your net worth. Add up the value of your assets – your home, cash in the bank, stocks and bonds, retirement accounts and anything else of financial value – and then subtract the value of your debts. Now look at how much liability coverage you have on your homeowners’ and auto policies. Are those limits enough to cover you if get sued? 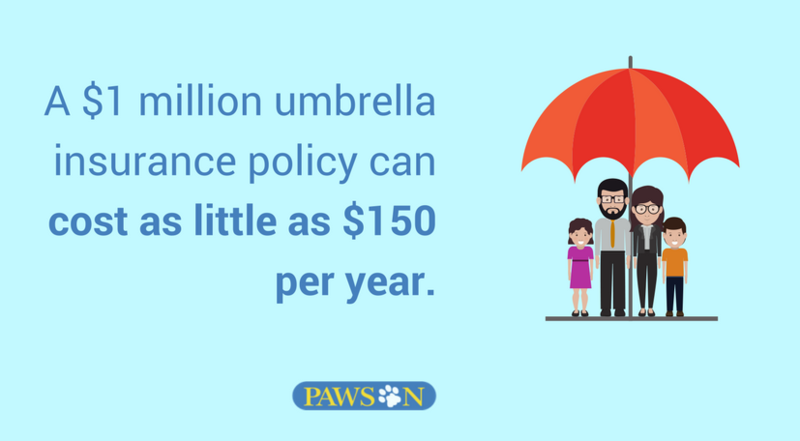 Umbrella policies are usually available in units of $1 million in coverage. It’s one of the best investments you can make, since the coverage is affordable and can offer valuable protection for your assets. Is umbrella insurance right for you? Contact a Connecticut insurance agent at Pawson and we’ll help you figure out your options.